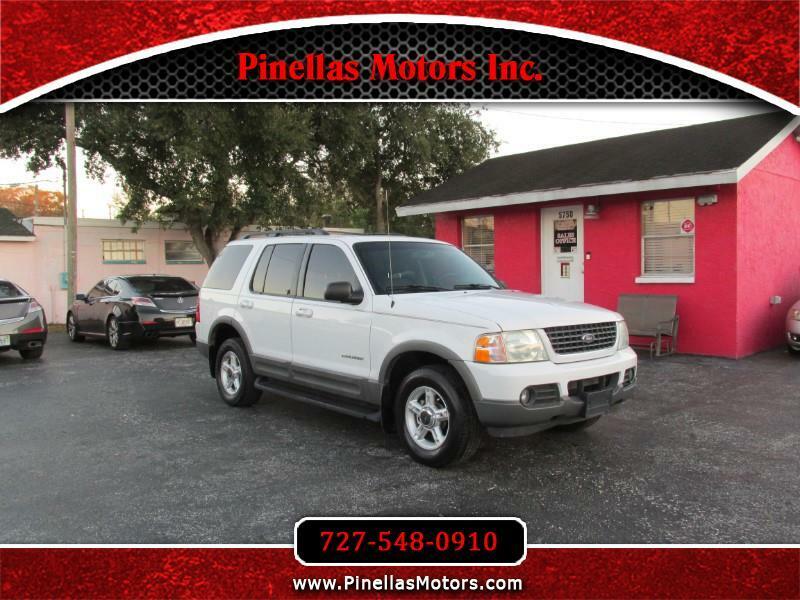 Used 2002 Ford Explorer XLT 4WD for Sale in Pinellas Park FL 33781 Pinellas Motors Inc. This vehicle is strictly priced for a cash sale. PLEASE VISIT OUR WEBSITE www.PinellasMotors.com FOR MORE PICTURES AND DETAILED INFORMATION AS WELL AS *FREE CARFAX REPORTS*. ***NO DEALER FEES...EVER!!! WE FINANCE EVERYONE! BAD CREDIT AND NO CREDIT IS NOT A PROBLEM! *** We work with a network of lenders that are aggressively seeking your business and are willing to FINANCE EVERYONE. Bad Credit, No Credit, Repossessions, Foreclosures, and Bankruptcies are NOT A PROBLEM! WE GUARANTEE YOU FINANCING! We also have IN HOUSE FINANCING or BUY HERE PAY HERE OPTIONS. Fill out an application on our website for a GUARANTEED APPROVAL WITHIN 15 MINUTES. Call us today to schedule an appointment and arrange a test drive at (727) 548-0910. We accept TRADE INS. We accept ALL MAKES AND MODELS. EXTENDED WARRANTIES are available on almost all of our vehicles. Due to our high inventory turnover, please call us in advance to make sure that the vehicle you are looking for is still in stock, MONDAY thru SATURDAY 10 AM - 7 PM at (727) 548-0910. We are located at 5750 PARK BLVD. PINELLAS PARK, FL 33781. Email us now at PinellasMotors@aol.com. Terms of Advertising: Although we try to remove sold units as quickly as possible, some may remain online so please call in advance to make sure that the vehicle that you are looking for is still in stock. Pinellas Motors Inc. and our 3rd party vendors make every effort to advertise prices, photos, and details correctly. We will promptly fix any errors within our listings once brought to our attention. Please call or check with a member of our sales team to verify ALL equipment stated or perceived as well as any questions regarding condition before purchasing any vehicle. Our online listings are for informational purposes only and are not deemed a contract. Pinellas Motors Inc. will not be liable for mistakes, errors, or omissions. All vehicle prices advertised on approved 3rd party websites and listings are valid for 7 days with printed advertisement. In case of discrepancies or 3rd party errors, prices listed on www.PinellasMotors.com will overrule all prices. All prices and specifications are subject to change without notice. Discounts and coupons are not stackable and available on retail prices only; they are not redeemable on internet special prices. Prices listed do not include additional fees such as sales tax, title, registration, finance charges, or other fees by a 3rd party. Internet special prices may not be valid with subsidized sub prime financing.